Kristina Junttila Valkoinen (1977) is a Norwegian/Finnish artist working in the field of Live Art. She constructs events and performances where modes of participation might occur, in sites such as hairdressers, old folks homes, lecture rooms or in the more traditional black boxes and galleries. The place, the context and the people of the performance is often the starting point. She acts as a performer, collaborator, director, researcher or teacher. She is interested in exploring performance as a place to be engaged in society and widening the concept of what form a performance can take. Themes of her artistic practice have evolved around the relationship between existing structures and the personal. In what ways do our surroundings, regulations and institutions influence our lives? Who have freedom, responsibility or power? Kristina lives in Tromsø, North Norway, where she is in the artistic board of Ferske Scener, a performing arts collective, she has a long term collaboration with being artistic leader in the art pedagogical project Snakk for deg sjøl, and collaborates with, among others, visual artist Kristin Tårnes, and dance artists. She is invited as artist to be in the reference group of a three-year project about art in public place in the city of Tromsø. She has several ongoing collaborative projects with artists in Finland, such as an artistic research project with Liisa Jaakonaho and an upcoming performance project with Maria Oiva and the art collective Reality Research Center. Currently she is part time a PhD-student in Art Pedagogy at UoT, Arctic University of Norway. Kristina teaches regularly at the same University, at other art institutions and at the Theatre Academy in Helsinki. 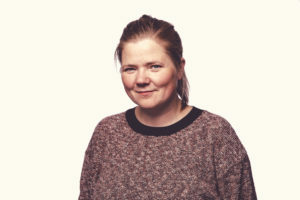 Kristina is active in RadArt, network for performing arts, and in organising of the festival Vårscenefest.